The Volvo V90 can be seen on roadways across the country. There are a number of significant reasons why the Volvo V90 is so widely regarded around the United States, including its assortment of interior features. The Volvo V90 interior features include high quality leather seats, available in a number of colors. In addition, the Volvo V90 seats include power adjustment and power lumbar support. The front seats are also heated. Our team here at Rickenbaugh Volvo Cars are excited to showcase the Volvo XC60 and a few of the luxury compact SUV features. The Lane-Keeping system in the new Volvo XC60 was designed to assist the driver in being able to recognize when the vehicle is leaving the lane accidentally. Smart technology is being utilized to make our everyday lives as easy and connected as possible. Android Auto is a hands-free way to connect your phone and car in tandem to create a safer and more connected driving experience. Android Auto has plenty of features like hands-free calling, music, and directions that are all streamed from your Android compatible phone. There’s a lot to love about the interior features of the Volvo XC90. You can enjoy premium upholstery, a lot of space, and plenty of tech. We can’t wait to show you the features when you visit us. The XC90 offers three rows inside of the SUV to seat up to seven. The third row is smaller, making it ideal for smaller adults and children. You can also fold the second and third row seats flat to make more room for cargo. As for upholstery options, leatherette is standard and you can upgrade to leather. When you are looking for a luxury vehicle, you want that to be a luxury vehicle in more than just its looks. The popular compact luxury sedan that is the Volvo S60 features a luxurious interior just as it features a luxurious exterior. You want luxury features in your car and you get that with the power lumbar support in the Volvo S60. You can feel your back being relieved when you are driving on long trips in this car thanks to the special feature that is set up just for drivers like you. Luxury compact SUVs have become an increasingly popular type of vehicle for consumers because of their additional cargo space in addition to its incredible technology features. That is why we here at Rickenbaugh Volvo are so excited to tell you all about the brand new Volvo XC60. One of the most popular luxury sedans on the market today is the Volvo S90. Its performance features set it apart from other similar sedans in it class. That is why we here at Rickenbaugh Volvo are so excited to tell you about the many features in the all new 2018 model! The S90 comes equipped with a performance engine capable of putting out up to 250 horsepower, making this car incredibly fun to drive. Also, the 258 lb.-ft. of torque will allow it to literally leap at the road before it. Customize your ride with special exterior styling, packages and color choices on the 2017 Volvo V90 R-Design near Denver, Colorado. From Interior style to wheels and upholstery, get the most out of your commute with the 2017 Volvo R-Design vehicle. Rickenbaugh Volvo, home of the Right Car, Right Price, Right Now guarantee, proudly serving the Denver, Colorado area. 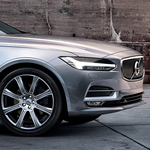 Rickenbaugh Volvo, proudly offering new, 2017 Volvo S90 vehicle models for sale in the Denver, Colorado area. Get behind the wheel and feel the difference owning a 2017 Volvo S90 can make. View online offers on new, Denver 2017 Volvo S90 for sale in Colorado and get in the fast lane! Want to know more about new, 2017 Volvo S60 vehicles for sale in the Littleton, Colorado area? Contact Rickenbaugh Volvo online, or simply click on the video above to learn more. 2017 Volvo S60 for sale! Reserve yours online and get ahead of the curve.